Show Notes: Welcome to a another episode of Wildstorm Addiction, our resident Wildstorm experts Joe David Soliz & Benjamin Murphy review Midnighter #9 and #10 (2015). 00:00:04 – Ben welcomes everyone to episode #56 for February and March 2016. 00:00:36 – Ben continues with the obligatory spoiler alerts warning for the issue being reviewed along with some news about DC’s Rebirth. 00:02:53 – Joe covers an epic listener mail this month with a new convert to Wildstorm, Grifter specifically. For the week of 2/24 – GRAYSON #17 – Wildcats cover!?!?! Nope, but lots of Grifter and Tao! For the weeks of 3/9 , 3/16 , and 3/23 – Batman and Robin Eternal #23, #24, #25 has many Midnighter appearances. For the week of 3/23 – GRAYSON #18 – The Syndicate with Grifter and Tao seek out Grayson and the Tiger. 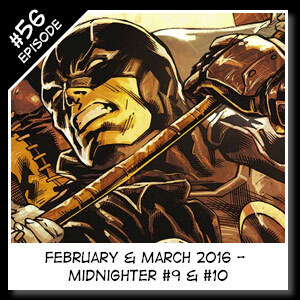 For the week of 4/06 – MIDNIGHTER #11 – At last, it’s the moment we’ve all been waiting for: Apollo returns! Midnighter’s caught in the crossfire between the Suicide Squad and Spyral—now he must team up with his ex to stop Henry Bendix from creating a monster! 00:25:32 – Joe gives some quick shout out’s to the new Facebook version of the Clark’s Bar: https://www.facebook.com/groups/1036575389702716/, down to 15 members. 00:26:51 – Joe finishes up with the contact details as shown below.The opening music is “Universal Domain” by Dreamline. Email us: wildstormaddiction@gmail.com (Reinstated, bring on some new listener mail!). This entry was posted in DCU, Midnighter, Podcast and tagged ACO, Carlo Pagulayan, Hugo Petrus, Jason Paz, midnighter, podcast, Ramulo Fajardo Jr, Steve Orlando. Bookmark the permalink.